Sheraton Macao – The Star Of Cotai – announces yet another early bird offer especially for the Indian Market. 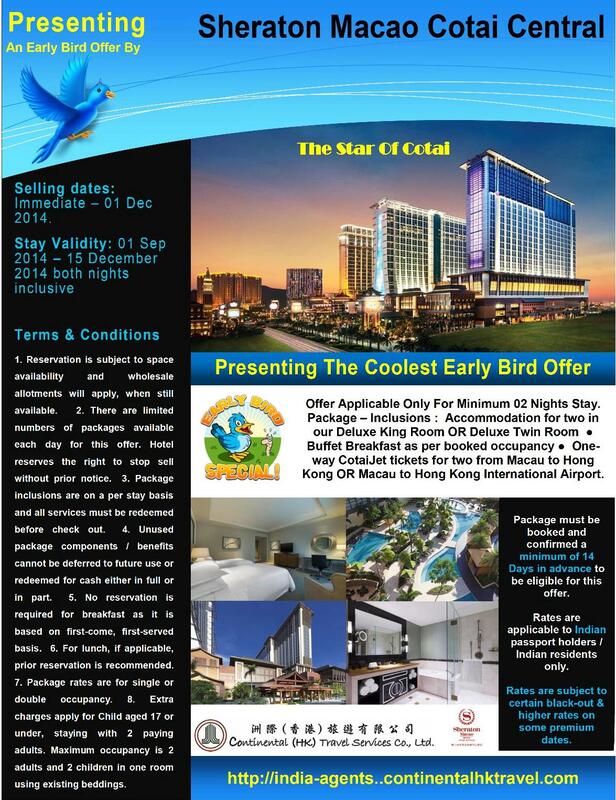 The package, which is open for sale alredy, is valid for stays between 01 Sept 2014 to 01 Dec 2014, both dates inclusive. Offer Applicable Only For Minimum 02 Nights Stay. Package – Inclusions : Accommodation for two in our Deluxe King Room OR Deluxe Twin Room ? Buffet Breakfast as per booked occupancy ? One-way CotaiJet tickets for two from Macau to Hong Kong OR Macau to Hong Kong International Airport. The package must be booked and confirmed a minimum of 14 Days in advance in order to be eligible for this offer. Rates are applicable to Indian passport holders / Indian residents only. The rates are subject to certain black-out & higher rates on some premium dates. So hurry, be an early bird and grab this special offer today !